You are here: Home / Age of the Earth / The Prelapsarian Ostrich: Paradise Lost or Portrait of a Good Creation? 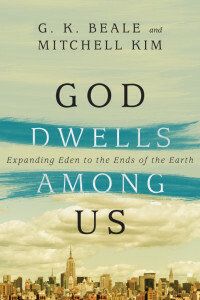 What was the ecological state at the beginning of creation? Were perfectly suited plants and animals created for a perfect world, did these plants and animals adapt to a fallen world, or were they all created in a way that anticipated a fallen world? Put another way, did animals physically adapt to a postlapsarian (after the fall) world or were they created with that world in mind? Theologians often wrestle with these questions of lapsarianism, the logical order of God’s decrees in relation to the Fall. While such questions may seem like asking how many angels can dance on the head of a pin, the answers to these questions aren’t just a matter of intellectual curiosity. How theists understand the initial state of creation (whether ancient or very young) and the fall and its effects on that creation have significant implications with respect to our views of how and why God created the world and its eschatological future. These implications affect our decision-making process with respect to understanding the origins of biological diversity. In the traditional Christian portrait of creation and the fall, Adam and Eve live happily and blissfully in the Garden of Eden. Adam and Eve commit the original sin by partaking of the forbidden fruit (or first listening to the serpent). As a result, the relationship between the couple and God is severely damaged and thus God expels them from the garden sanctuary. As sinners for the first time, God’s justice would not allow them to come into direct contact with his presence. Redemptive history begins here and finds its solution in the acts of Jesus Christ who provides a way for man to be whole with God and enter into his presence once again. Ironically, those who call for the most clear meaning based upon the text provided, create a situation in which meaning, well beyond the original language, must be conferred upon the words we find in scripture. For example, many Christians, as exemplified by apologetics ministries such as Answers in Genesis and the Institute for Creation Research, have posited ideas and philosophies that completely transcend the concepts that are clearly set forth in the verses that we read such as the specific effects of original sin, the significance of “very good’ and the source of the light that is present at the beginning of Genesis 1. For example, many young-earth creationists believe that Adam’s original sin physically altered all living things (1) and possibly even the rest of the physical universe. (2) Whereas traditional (or historical) views of creationism viewed ecological changes initiated by Adam’s sin as likely limited to behavioral (or relational) changes. For example, it was once commonly believed that God made lions much they are today but the fall caused them to seek animal prey rather than eating plants. But now, the expanded view of some Christians see the edenic lions as a generic created-form of feline that would have had no need for retractable claws, sharp teeth or the ability to outrun its prey, and so, therefore, may not have expressed any y of these traits. As such, the postlapsarian (after the fall) characteristics of lions were either the result of a radical physical re-creation by God following man’s fall or–as most modern-day young earth creationists now propose–the product of latent genetic potential that was preloaded into the original generic, but perfect, feline form. This “preloading” was done to prepare it for conditions after death entered into the world through the inevitable commission of sin. God’s curse on the ground in Genesis 3:17 would have been the moment in time when a physical switch was flipped releasing the hidden genetic potential within the species destined for life in this new world of death and decay. 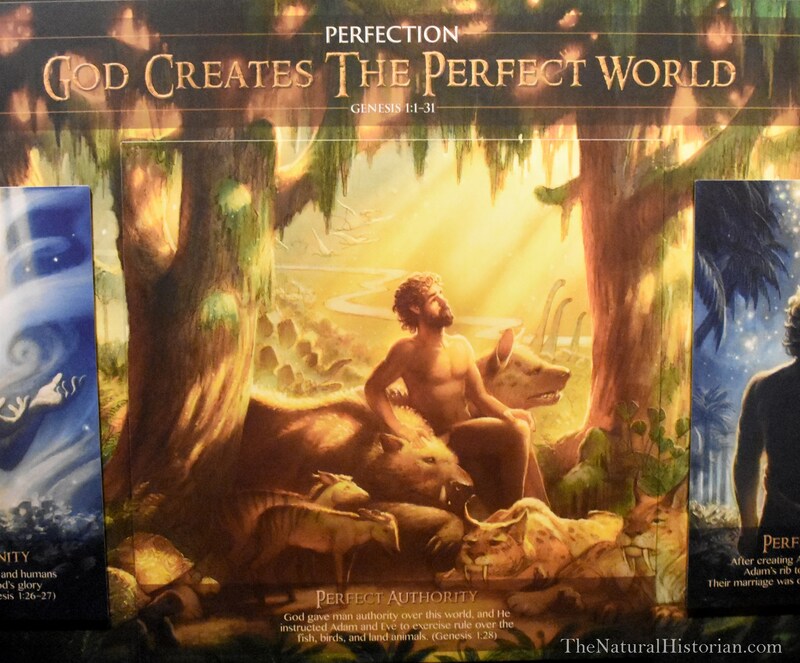 Put another way, the animals (even mosquitos and viruses for that matter) in the original perfect paradise were predestined to become, by some process, the physical forms we see today. Second, YECs equate the description of the creation as being “very good” to a perfect paradise where death or any physical harm to air-breathing vertebrates (those animals with the “breath of life”) was not possible. (1) Furthermore, they confer this condition of a perfect paradise upon the entire surface of the earth, instead of the particular geographical location of the Garden of Eden. This, despite the fact that the extent of Eden in which this Garden does not seem to be the whole globe but rather a place on earth. Due to these presuppositions about the prelapsarian state of the earth and the things living in it, many Christians believe that the only orthodox understanding of the creation account requires a belief that the entire physical world we see today was manifestly, and dramatically, altered by Adam’s sin in the Garden of Eden. Furthermore, they believe that the relationship of animals to man, their behavior toward one another, and their relationship to the environment have all been radically changed at a physical level, despite the fact that they were called “good” by God. Man and his sin are solely responsible for this damaged earth. With a view in mind that the whole creation is corrupt, eschatological hope is offered of a return to the ecology of Eden (the prelapsarian state.) Here animals, or things with the “breath of life” (see footnote 1), will no longer die but will live in harmony with each other in physical relationships, like those of the original “very good” garden which they assume was the state of the whole earth. 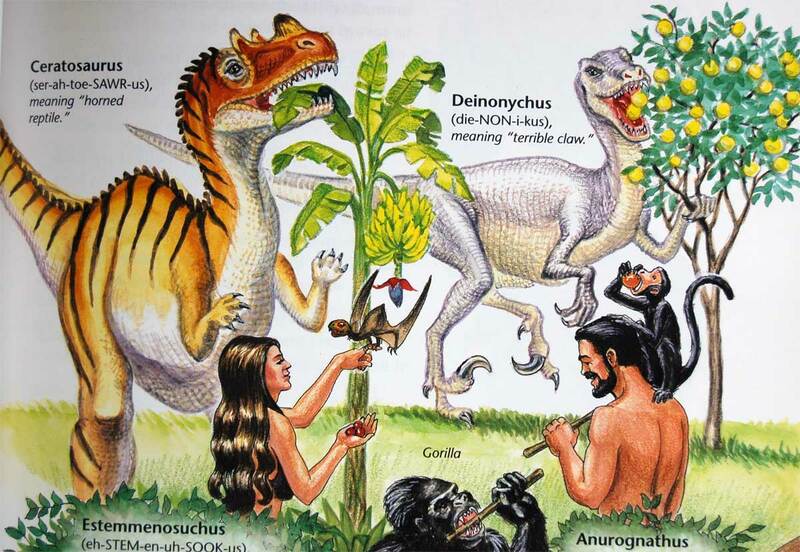 An photo of a page from Ken Ham’s “Dinosaurs in Eden” book. Here we can see Tyranosaurus-like dinosaurs with small arms enjoying a diet of flower plants. This book seems to be supporting a view that the prelapasarian animals were created with many of the characteristics (sharp teeth, claws, strong muscles) they would need after Adam sinned and their diet would switch to carnivory. However, this view has been changing as more and more YECs are moving to understanding of the created kinds as not expressing these traits but rather being created with the “genetic potential” or “created heterozygosity” that would allow these traits to “evolve” after the fall for the postlapsarian world. But, was the Garden of Eden, and Eden in general, truly a description of a radically different earth where the laws of providence did not function as they do today? What were the prelapsarian rules which governed the world before sin entered the picture? Did these prelapsarian rules extend out over the entire earth? Paul’s words in Romans 5:12-18 referencing the sin of Adam bringing death into the world is the go to verse to support this view. But can Paul’s words be conferred upon all animals and plants? (Death before the fall? See Footnote 3) Is the rest of the Bible silent on this issue? I don’t believe so. Previously (Comparing Theistic Models of Origins) we described three different YEC models for the origins of the ostrich. We have also noted that Job’s account of the ostrich describes the same physical and behavioral characteristics with which we are familiar today (See: Consider the Ostrich: Job 39 and God’s Creation). Today, we consider the origin of the ostrich within the context of the YEC belief and hermeneutical system. We will consider the growing YEC acceptance that animals such as the ostrich are the product of the radical physical changes that occurred during the transition from the prelapsarian to postlapsarian world. What might the account of the ostrich in Job tell us about its origins? 13 The wings of the ostrich wave proudly, But are her wings and pinions [like the] kindly stork’s? Our attention is drawn to Job 39:17 (Because God deprived [the ostrich] of wisdom, and did not endow her with understanding). The New King James Version translated two Hebrew words as “deprived” and “endow.” These terms are infrequently used in Scripture but have been translated variously as “caused to forget” and “given”, or, “imparted” and “given a share of” respectively. A straightforward reading—one espoused by YECs for Genesis—of this passage tells us, especially when the context of the rest of the chapter is considered, God is explaining how he made (or “formed” as Genesis 1 says) the ostrich. To establish the context of this description of the ostrich we need to look back to chapter 38. Here the author (see footnote 4) of Job brings us to the penultimate speech of the book. God comes to Job in the whirlwind—a chaotic force of nature––and ask Job if he was there at the beginning when He formed the earth and all that lives upon it. He goes on to talk about the pillars of the earth, laying its cornerstone, wrapping it in clouds etc.. The author is invoking images of the creation of the heavens and the earth. We are being taken back to the prelapsarian world. The world even before Adam. Interestingly Chapter 38 mixes together images of the very beginning—the six days of creation—or even the idea in God’s mind prior to the creation with features from the author’s postlapsarian world. In Chapter 38 there is no evidence that the condition of the Creation whether pre- or postlapsarian is anything but how God intended it to be. It is very good and God is the author of it. When we move to Chapter 39 we find the author turning his attention to the living things he placed on the earth. Again, there is no indication that God is referring to some sort of post-fall version of animals adapted to a sin-corrupted world. Rather, God is saying here that He made the ostrich and endowed it—presumably from the very beginning— with the characteristics listed in this passage. There is no indication that the ostrich was initially created such that she took “perfect” care of her young or that her actions led to absolutely no egg ever being lost (either broken or just never developed and hatched) or that her young wouldn’t be snatched by wild animals. Nothing here suggests that because creation suddenly broke and God had to reimagine the ostrich in a postlapsarian state. The natural order of the world, as witnessed at the time of Job, was assumed by the author of Job, through God’s words, to represent the condition of God’s creation. Not only that, but in this passage we have God telling us (see footnote 4 about authorship of Job) directly that this assumption is correct. God never scolds Job nor does Job scold his friends for attributing what they saw around them as being anything but what God created. There is no hint that the present world is not the same as His original creation. There is no hint here that the original ostrich would have been unrecognizable to Job and that God has graciously provided for the ostriches’ survival in this world despite Adam’s sin. What we see instead is God saying this is the way that ostrich is supposed to be, that He intended her to be this irresponsible and unwise creature–at least in our eyes. (6) We read that “her wings are not like the storks”, yet we will see in the next installment of this series that some young earth creationists believe that many, if not all, flightless birds were initially created with the ability to fly but that capacity was lost as a result of Adam’s sin. What is the scriptural justification for believing this? Why would the Bible say so much about the description of the modern ostrich and not comment on the ostriches’ initial state if it were so radically different? Let me end this post here by saying that I think we should be careful to understand that to call the whole creation “very good” is not to same as saying that the ecology of these animals is the very best that it could be. Good – yes, best – no! How do we know this? We know this because the earth that God formed and filled so that it would be habitable for man was never, in that condition, meant to be the ultimate endpoint of the creation. We might say that the creation was immature because we see that Adam was given the command to protect and care for the Garden sanctuary and to cause it to expand over all the earth. There were commands to follow his word and to fill the earth and a promise of a future. Man was not created to live forever in the Garden of Eden as it was, but instead was created for a higher purpose. Man was to be God’s vice-regent to tend and keep the creation and, I take it, to expand the temple garden over the face of the earth. He failed to achieve that purpose. But, through Christ man is redeemed and has a hope for the future that is more glorious than life in that land of Eden of the past. Today, many Christians are apt to look back at the “good” creation and yearn for a return to a “perfect” prelapsarian paradise that is from their imagination rather than looking forward to the perfect world to come. Next up I will ask the question: From the modern YEC perspective, what did the original ostrich “kind” look like? Was the ostrich able to fly in the past? Where there any prelapsarian flightless birds? This will lead us to ponder the creationists’ idea of species limits (baraminology) and ultra-fast evolution. This article is part III of a series examining the ostrich as described in the book of Job. The first two parts of this series where: Consider the Ostrich: Job 39 and God’s Commentary on His Creation and Consider the Ostrich: Comparing Theistic Models of Biological Origins. 1) What is the Breath of Life? – the scientific and Biblical definitions of life are quite different. It is difficult to know just what groups of animals correspond to the category of having the “breath of life” in the Bible but at least all vertebrates and possibly other animals. What aren’t included are plants, fungi and bacteria and thus creationists frequently argue that they don’t die in the sense that animals are able to die. For more about the YEC views of life and death please see: Plants and the Biblical Definition of Life and Ken Ham’s Aversion to “Life” on another Planet. 2) Did sin physically change the universe? Most YECs believe that Adam’s sin triggered effects across the solar system and possibly the rest of the Universe in addition to altering the ecology and geology of the Earth. https://creation.com/the-fall-a-cosmic-catastrophe Sin may have caused planets to run into each other creating meteorites which them caused the craters on the Moon and Mars. For example, I’ve written about how YEC believe Adam’s sin caused flooding on Mars as well as on Earth (see: Young Mars Creationism). 3) Death before the fall?— The assertion that no death was possible before Adam’s sin forms one of the most foundational principles upon which the entire young-earth creation doctrine is based. To understand death one has to understand what is “alive” and footnote one makes the points that what is “alive” is not agreed upon by all YECs. However, all YEC agree that death of man and vertebrate animals did not happen before the fall. There are many articles and books that have addressed this position. I would point you to the BioLogos.org series HERE and article by Dr. Ted Davis on death and suffering HERE. I also recommend the second half of the book Death Before the Fall by Ronald Osborn and The Groaning of Creation: God, Evolution, and the Problem of Evil. By Christopher Southgate as books that explore questions about death and the fall of man. 4) Authorship and genre of Job – In the post above, as in the previous ones in this series, I have assumed a common view of inspiration held by young earth creationists which take Job to have been written by a human author who recounts a series of historical events. These events and dialogue include those that a human author could not have witnessed but it is assumed that God provided the information for the actions that occurred “behind-the-scenes” either through a vision or some form of dictation. Within this construct of inspiration, the words of God in Job 39 are the recorded words of God spoken directly to us about the ostrich. A different view of Job’s authorship, that could still be considered an orthodox view of the doctrine of inspiration, says that the author of Job was a poet who, pondering the problem of suffering and God’s sovereignty, uses the life of Job, a historical person, though the words spoken by Job, his friends and God are not necessarily the words spoken verbatim by the participants. Likewise, all of the scenes (e.g. Satan appearing before the angels and God) need not be considered literal accounts but poetic devices. In this case, the words of God are what the inspired author accurately understands what God’s response would be to the state of Job and his friends. Of course, there are more liberal approaches that would take the whole book as the imagination of a non-inspired poet who is trying to understand why God would allow suffering. In this case, there is no historical basis for Job and it merely represents a story with a moral lesson. Regardless of whether the text of Job 39 records for us the actual spoken words of God or the inspired imagination of man regarding what God would say “behind the scenes,” what we learn about the ostrich allows us some insight into what the biblical authors and the audience believed about the initial state of creation. 5) Jesus addresses the retribution principle — A similar scene plays out in the gospel of John (9:1-12) where Jesus sees a blind man and is asked who sinned, the man or his parents? The disciples who ask this question have a similar view some of Job’s friends. They have the retribution principle in mind. Interestingly, Jesus’ response was to redirect the question to focus on God’s wisdom rather than explain His justice. Ken Ham and all of us could take a cue here to focus our thoughts on what is important rather then trying to figure out his means of divine action in these passages. 6) Is the ostrich foolish? The author of Job characterizes the actions of the ostrich as carelessness and disregard. This is certainly understandable if one watches the behavior of an ostrich. But, could God be accommodating to the knowledge of the ancient writer of Job? A modern biological understanding of the behavior of the ostrich does not see the same foolishness. The features that we might think are “foolish” at first glance actually work to ensure that good genes are passed to the next generation. In this case, evolutionary theory helps us see that these behaviors are not bad. The eggs that are laid last in the nest are done so by the last female who lays eggs there and who pushes aside other eggs of previous male suitors. This assures that the eggs that are most likely to produce viable young come from the dominant males. In other words, the genes from the most fit members of the community are most likely to be passed on to the next generation as a result of this nesting behavior. We are ascribing human moral behavioral traits to animals which was not uncommon in Job’s day or even ours. The authors of Job is using Job’s and his friends common perceptions of these behaviors to make God’s point. God does not need to show him just why the ostrich behaves this way. They only need to know God made the ostrich it this way. This passage is all about establishing authority and showing Job that God made him too and so he need to question is purposes. If we are looking to answer why an ostrich is foolish we are looking for the wrong thing from this passage of scripture. 7) Behemoth: standing firm in the presence of chaos — The behemoth and leviathan stand as chief examples of God’s point made to Job. That point isn’t what they equate to as in the physical world (i.e. what animal was being described whether a bull, a hippo or dinosaur), but rather that whatever the creatures represent to Job and his friends stood firm against chaos. They were strong and would not budge. God doesn’t say they defeated the chaos around them but only that they resisted. We don’t defeat chaos. We don’t understand suffering but we can know that God is wise and we should hold fast to that in the raging waters. God’s creatures trust God rather than rebel and question as Job and his friends had and we ought to do the same when we wish to question his justice. Great post Joel. I think that it is interesting that dinosaurs are shown in the children’s book to be eating flowering plants when no dinosaur on the earth can be found fossilized with flowering plant remains. Fossil flowering plants are securely dated to the cretaceous and molecular evidence suggests they existed in the middle Triassic or earlier. Yes, there are an abundance of evidence of flowering plants in the Cretaceous now and even the Jurassic. Though, the types of flowering plants from the Jurassic and even the Cretacous would not have include most of the “modern” groups that are shown in that picture. Even Jurassic dinosaur coprolites suggest that plant eating dinosaurs ate an abundance of gymnosperm and ferns rather than flowering plants and so it seems that the were not a dominant part of the flora for a while. Thanks for the clarifications, both of you. I was trying to be funny, but, as my wife always says, it didn’t work out just so. In Genesis 3:3 did not Eve say that God told her not to eat the fruit from that tree or she would die. Does this show that Eve knew what death was? If there was no death before the fall, how would she know what death was? There is the concept that God created a “fallen” world knowing beforehand that man would sin. As Jesus’ sacrifice is retroactive for those that died before the Cross so God’s Creation was condemned before the actual sin. This is an Old Earth Creationist doctrine and seems to be the best explanation. I’m curious where you heard or learned of this theology and doctrine. Abraham was saved by his faith in God, not some retroactive redemptive work of Jesus Christ, according to Romans 4. I’ve never heard this or read this in any OEC literature that I have seen and would be interested to know your sources. These are good points you raise. To me, it is quite obvious that death was present “in the beginning”. People easily skip over the last few verses of Gen 3 where God drives the couple out of the Garden of Eden, least they stretch out their hand and take from the tree of life and thus live forever. Why did Adam and Even need a tree of life if they were perfect/eternal to start with? This makes little sense. Clearly, they were mortal but dependent upon God for eternal life. Now that’s a theological thought if ever there was one. People have been struggling with human mortality for a long time. And despite Christianity’s belief in the death and resurrection of the Christ, people STILL die. Why? Because mortality is our birth right. Tolkien even wrote mythical fiction about it (the gift of mortality). Many are in philosophical and religious denial of this fact but twisting the Scriptures will not make it go away. We were made mortal but it need not be our destiny.